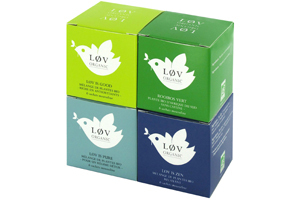 Based on an amazing blend of vegetables and fruits, Løv is Green helps you to drink your greens ! The theine-free infusion Løv is Green provides you a unique tea-experience drinking through a new formula for wellness. The green and surprising taste of spinach leaves combines perfectly with juicy and acidity flavours of pear and apple. However, the genuine star of this organic infusion is the carrot and its delicious sweet flavour ! Carrot*, spinach*, pear*, apple*, pear flavours.